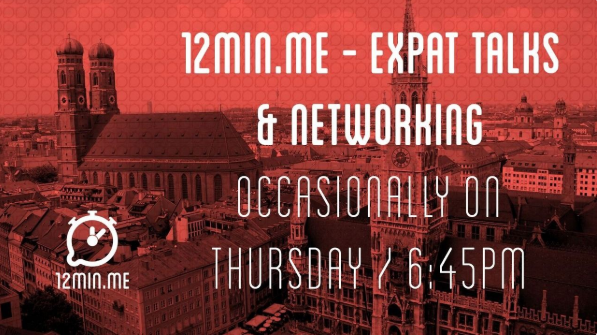 Welcome to 12min.me in Munich: Talks, discussion and networking – all in a 12-beat! He/she has 12 minutes to spare and the clock is merciless! Whether in German or in English – compact, concise and to the point. Subsequently, the audience also has 12 minutes to ask questions and discuss any issues that have not yet been discussed. You will not only have the opportunity to listen to interesting presentations by clever minds on cutting-edge topics and then exchange ideas with the speakers. It will also be a good opportunity for networking after the presentations. Would you like to get your own 12 minutes and present your own topic? Just write to us! – Drinks and snacks should of course be provided. – The number of participants is limited each time, so please register bindingly. We are looking forward to exciting lectures and interesting people! PS: For all of you who would like to perform as a speaker: please contact us (munich@12min.me or contact us directly at the event)!